Double-U-Eye-Kay-Eye WIKI Radio: Who's Calling? This wiki radio thing has been playing on my PC for over two weeks now and anytime I open up my multi-tabbed Avant Browser bringing me back to the last 36 Web pages I am working on, I can hear the rock guitar intro of the WIKI Radio blast through my speakers. 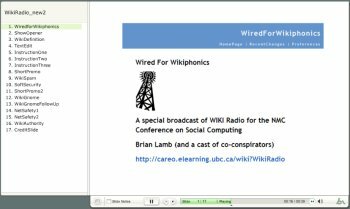 If you have ever been curious to find out more about wikis and their uses in education, you can really learn quite a few things by listening and watching this absolutely phenomenal fake radio show created by Brian Lamb and its great clique of professional friends (Alan Levine, D'Arcy Norman, Jeff Miller, Kele Fleming, Michelle Chua, Keira McPhee, Novak Rogic). Brian Lamb has set up such an enjoyable show that I really invite more of you to use this, nonetheless how alien it will initially feel to you, as a model for truly delivering information in an enjoyable, comprehensive, digestible and VERY accessible format. This is what learning is all about. If instructional designers and e-learning maestros would move away from converting PowerPoint presentations into Flash or converting traditional books into PDF guides while calling all this e-learning, you and I, as passionate students, would gain a lot. I strongly encourage you to spend some time looking and listening at this creative performance. In my humble opinion it is so good, that like good music, you really need to play it a few times to appreciate fully the true of all of the communication layers embedded into it. and NOT of Macromedia Breeze. The effective delivery and distribution results can be obtained with much more affordable tools like Articulate Presenter, Macromedia Captivate or TechSmith Camtasia. Macromedia Breeze outstanding merit goes to the excellent user experience it provides in distributing/publishing this type of content online while making it accessible to all typologies of users, on different computer and operating systems and without requiring any software installation. (It would be wonderful if Breeze allowed in-depth linking into anyone of the recorded slides). A Wiki is a piece of server software that allows users to freely create and edit Web page content using any Web browser. Wiki supports hyperlinks and has a simple text syntax for creating new pages and cross-links between internal pages on the fly. Like many simple concepts, "open editing" has some profound and subtle effects on Wiki usage. Allowing everyday users to create and edit any page in a Web site is exciting in that it encourages democratic use of the Web and promotes content composition by non-technical users. Anyone can change anything. Wikis are quick because the processes of reading and editing are combined. The signature of a wiki is a link at the bottom of the page reading "Edit text of this page" or something similar. Clicking that link produces the page's hypertext markup, allowing instant revisions. Authoring software, permissions, or passwords are typically not required. Wikis use simplified hypertext markup. Wikis have their own markup language that essentially strips HTML down to its simplest elements. New users need to learn a few formatting tags, but only a few. Most wiki tags significantly streamline and simplify their tasks. Linking to related pages is easy, which promotes promiscuous interlinking among wiki pages. Content is ego-less, time-less, and never finished. Anonymity is not required but is common. With open editing, a page can have multiple contributors, and notions of page "authorship" and "ownership" can be radically altered. Content "cloning" across wikis--sometimes referred to in non-wiki circles as "plagiarism"--is often acceptable.